In a context of a ‘criminal economy’ dictated by the laws of supply and demand, organized crime operates favoured by social tolerance for certain types of crime. This context continues to shape the organised crime landscape: individual criminals and criminal groups, without forgetting the ‘grey zone’, quickly adapt to exploit new partnerships and victims, to evade countermeasures or identify new criminals opportunities. The role of Libera is, above all, to contribute to understand these dynamics in order to learn and see how this phenomenon is diffused. In the new Statute of Libera (2015) it has been formally included for the first time the international dimension of Libera’s network. Since this date, it has been recognized the transnational action of promotion of social justice and human rights in worldwide, fighting against Mafia systems and corruption. 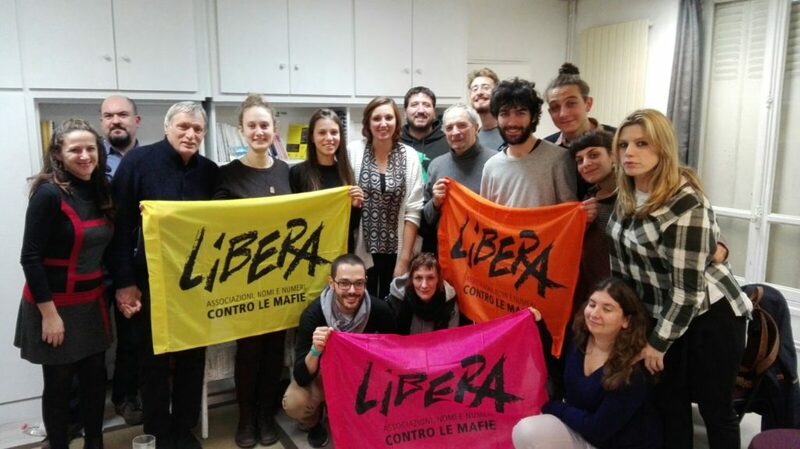 Libera in Europe bases its action on two branches: networking and social activities to foster a six point agenda referred to our activities in Europe and in the European Union. 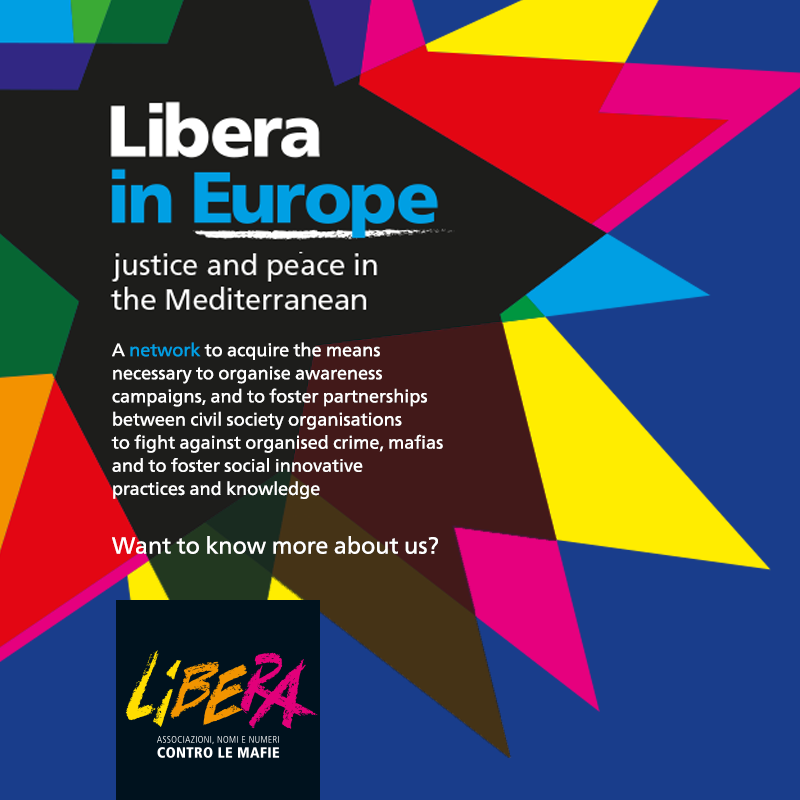 Libera in Europe began its mission in 2008 with the aim of coordinating, at the continental level, the efforts of numerous activists within civil society that are in favour of promoting democratic legality. We work for the enforcement of a network aimed at cooperation between various organisations of civil society that fight against the Mafia and those that are opposed to organised transnational crime. We strive for a network able to acquire the means necessary to exert social pressure on legislative processes at the local and European level, to organise awareness campaigns, and to foster partnerships between member organisations through the pursuit of joint projects and the exchange of innovative practices and knowledge. In accordance with the national level, the ‘we’ of Libera has also a geographical meaning. There is always a ‘beyond’ and an ‘elsewhere’ to be reached with the Anti-mafia Roadshows. More than 1600 associations and social realities in Italy, 370 antennas from the north to the south of the whole Italian territory, Libera is aims to create a new social subject able to work in organized civil society also abroad acting as global actor. Libera’s international co-action is not based on the creation of new Libera’s offices, but on the construction of transnational networks with different local, national and international social realities. In particular we are working on Latin America, Africa and Europe. As Libera, we don’t consider directly the emergency assistance. It is necessary to look at the root of the problem in its illegal nature, and not only that. The social, economic and political reasons are the ground in which criminal and violent actions establish their roots, transforming human lives in traded commodity. “A group of 3 or more persons existing over a period of time acting in concert with the aim of committing crimes for financial or material benefit”. However, this definition does not adequately describe the complex and flexible nature of modern organised crime networks. Arising from the efforts of Libera and Terra del Fuoco, FLARE – Freedom Legality And Rights in Europe- was created in June 2008 with the aim of coordinating at continental level the efforts of numerous actors within civil society that are in favor of democratic legality. FLARE was an independent network which has worked for social pressure on legislative processes at the local and European level, to organize awareness campaigns, and to foster partnerships between member organizations through the pursuit of joint projects and the exchange of innovative practices and knowledge. From the intuition of creating a more unified movement in Europe, FLARE has been a formal network with an independent and vertical structure. Thanks to its coordination, it has been possible for Libera to begin to promote the social fight against organized crime at European level. However it has been progressively more clear that FLARE’s rigid frame was an obstacle to develop the creation of a real participatory and circular process of European civil society. When it became clear that there wasn’t a potential for convergence anymore , Libera decided to take a step back and to redesign an European participatory process through informal paths and a network rethought from below. This remodulation has been driven by Latin American experience of Libera in the creation of ALAS – America Latina Alternativa Social: an informal network gathering together more than 40 organisations from 12 countries from all over Central and South America. Since September 2016, after a change of direction in the internal organization of the International sector of Libera, we are working on the reconstruction of our European network. We are working on the creation of a new European network composed by associations, NGOs, antennas (founded by the Italian citizens living abroad) and local entities which are committed in the promotion of social justice, fighting against organised crime and corruption. Together with all organizations and realities we are working with, we are rethinking a common agenda of goals, in accordance with our specific mission as Libera. This entry was posted in Europe and tagged antimafia, Europe, Libera in Europe, Libera International, mafia. Bookmark the permalink.